Offer: Buy “First Passage” and get a discount on “The Amorgos Conspiracy “. The book is a road-map for anyone from an immigrant background who has to satisfy the demands of more than one culture. It also recounts the kind of interplay of money and control that will be familiar to anyone from a wealthy family. Humorously written, in the tradition of J.D.Salinger’s The Catcher in the Rye or Philip Roth’s Goodbye, Columbus, First Passage is about adolescence and early manhood about family ties (and knots) – the story of a young man’s search for his place and purpose in a life of swirling confusion. 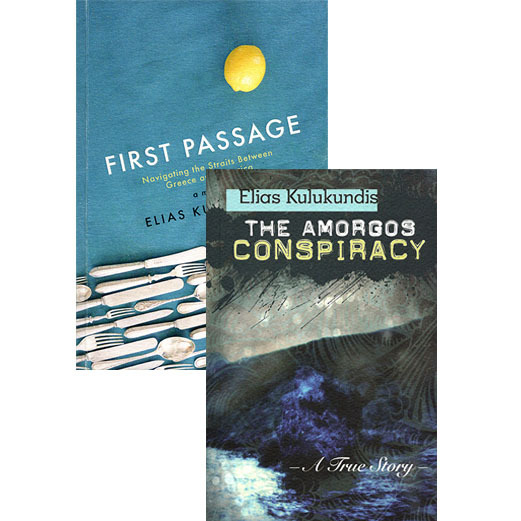 The Amorgos Conspiracy is the true story of the escape of George Mylonas, a political prisoner during the colonels’ dictatorship of the 1960’s, from a remote Aegean island. A gripping tale by Elias Kulukundis. The Amorgos Conspiracy, was published in Greece in November 2012 and is now available in English.It will soon be available in Italian as an eBook.